getPassiveIndex computes various measures of the excess or shortage of passivity for a given system. R = getPassiveIndex(G) computes the relative passivity index. G is passive when R is less than one. R measures the relative excess (R < 1) or shortage (R > 1) of passivity. For more information about the notion of passivity indices, see About Passivity and Passivity Indices. nu = getPassiveIndex(G,'input') computes the input passivity index. The system is input strictly passive when nu > 0. nu is also called the input feedforward passivity (IFP) index. The value of nu is the minimum feedforward action such that the resulting system is passive. rho = getPassiveIndex(G,'output') computes the output passivity index. The system is output strictly passive when rho > 0. rho is also called the output feedback passivity (OFP) index. The value of rho is the minimum feedback action such that the resulting system is passive. tau = getPassiveIndex(G,'io') computes the combined I/O passivity index. The system is very strictly passive when tau > 0. DX = getPassiveIndex(G,dQ) computes the directional passivity index in the direction specified by the matrix dQ. index = getPassiveIndex(___,tol) computes the passivity index with relative accuracy specified by tol. Use this syntax with any of the previous combinations of input arguments. index is the corresponding passivity index R, nu, rho, tau, or DX. index = getPassiveIndex(___,tol,fband) computes passivity indices restricted to a specific frequency interval. [index,FI] = getPassiveIndex(___) also returns the frequency at which the returned index value is achieved. [index,FI,Qout,dQout] = getPassiveIndex(___) also returns the sector matrix Qout for passivity and the directional index matrix dQout. Compute the relative passivity index. The system is passive, but with a relatively small excess of passivity. Compute the input and output passivity indices. This system is both input strictly passive and output strictly passive. Compute the combined I/O passivity index. The system is very strictly passive as well. A system that is very strictly passive is also strictly positive real. Examining the Nyquist plot confirms this, showing that the frequency response lies entirely within the right half-plane. The relatively small tau value is reflected in how close the frequency response comes to the imaginary axis. Model to analyze for passivity, specified as a dynamic system model such as a tf, ss, or genss model. G can be MIMO, if the number of inputs equals the number of outputs. G can be continuous or discrete. If G is a generalized model with tunable or uncertain blocks, getPassiveIndex evaluates passivity of the current, nominal value of G.
Here, index is any of R, nu, rho, tau, or DX, depending on which input arguments you use. 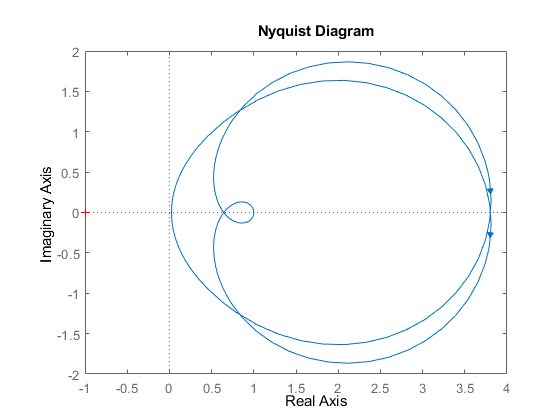 Custom direction in which to compute passivity, specified as a symmetric square matrix that is 2*ny on a side, where ny is the number of outputs of G.
The rho, nu, and tau indices each correspond to a particular direction in the y/u space of the system, with a corresponding dQ value. (See dQout for these values.) Use this argument to specify your own value for this direction. Relative accuracy for the calculated passivity index. By default, the tolerance is 1%, meaning that the returned passivity index is within 1% of the actual passivity index. Frequency interval for determining passivity index, specified as an array of the form [fmin,fmax]. When you provide fband, then getPassiveIndex restricts the frequency-domain computation of the passivity index to that frequency range. For example, the relative passivity index R is the peak gain of the bilinear-transformed system (I-G)(I+G)^-1 (for minimum-phase (I + G)). When you provide fband, then R is the peak gain within the frequency band. Specify frequencies in units of rad/TimeUnit, where TimeUnit is the TimeUnit property of the dynamic system model G.
Relative passivity index, returned as a scalar, or an array if G is an array. The system G is passive when R is less than one. R < 1 indicates a relative excess of passivity. R > 1 indicates a relative shortage of passivity. When I + G is minimum phase, R is the peak gain of the bilinear-transformed system (I - G)(I + G)^-1. (or the discrete-time equivalent). The system is input strictly passive when nu > 0. nu is also called the input feedforward passivity (IFP) index. The value of nu is the minimum feedforward action such that the resulting system is passive. for all T > 0. The system is output strictly passive when rho > 0. rho is also called the output feedback passivity (OFP) index. The value of rho is the minimum feedback action such that the resulting system is passive. for all T > 0. The system is very strictly passive when tau > 0.
for all T > 0. The rho, nu, and tau indices correspond to particular choices of dQ (see the output argument dQout). To compute DX, the software uses the custom dQ value you supply, dQ. Frequency at which the returned passivity index is achieved, returned as a nonnegative scalar, or an array if G is an array. In general, the passivity indices vary with frequency (see passiveplot). For each index type, the returned value is the largest value over all frequencies. FI is the frequency at which this value occurs, returned in units of rad/TimeUnit, where TimeUnit is the TimeUnit property of G.
For more information about sector geometry, see getSectorIndex. For instance, for a SISO system, dQout = [0,0;0,1]. For instance, for a SISO system, dQout = [1,0;0,0]. For instance, for a SISO system, dQout = [1,0;0,1]. DX — dQout is the custom value you provide in the dQ input argument. R — The relative passivity index does not involve a direction, so in this case the function returns dQout = . For more information about directional indices, see getSectorIndex.